HAWAII (KGO) -- A man in Hawaii is sharing a miraculous story of survival. Doctors say he was minutes away from death, being attacked by a massive shark, but his will to live was even stronger. 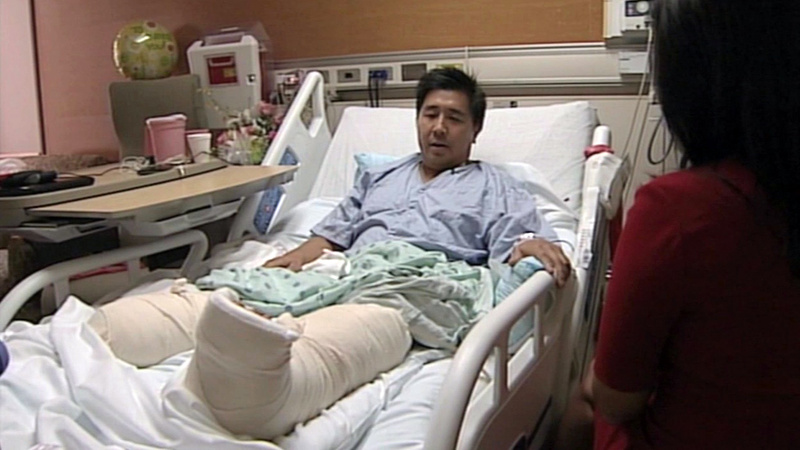 Tony Lee, 44, was attacked over the weekend off the coast of Lanikai. Lee says the shark had both of his legs in his mouth and pulled him underwater repeatedly, but Lee put up a fight. "I had goggles on, so I could see things really clearly, and I kept thinking that if I just kept punching him, he would let me go - he wasn't doing it," said Lee. Lee lost one foot and will undergo surgery to save the second. Lee's an avid athlete and doctors say that will help in his recovery. He says he looks forward to getting back to hiking and biking. It was pure chance that Julian Liverton and his son Charlie were there. They had been catching waves in their one man canoes by the Mokuluas, when Julian's boat got a crack in it. As they headed back, they heard Lee's screams.